HomeElectricityEnergy conservationEnvironmentGadgetsGreen ProductsWant to Reduce Your AC Energy Bill? Mistbox Can Cut by 30 Percent! Want to Reduce Your AC Energy Bill? Mistbox Can Cut by 30 Percent! No one can deny the fact that present level of global warming is more harming our lives and ecosystem than ever before! We have become a habitual for the comfort of an air conditioner in both summers and winters to ensure that the indoor workplaces are temperature controlled. In fact, air conditioning is said to make the environment even hotter due to its contribution to global warming. It increased use is escalating pollution in the environment by releasing gases into the environment. Furthermore, a chronic issue of the air conditioning system is, it consumes a lot more electricity and put a strain on the electricity generation industry. It adds more pollution considering the generation of electricity involves burning of coal in some countries. Now a question arises, how to reduce its energy consumption and curtail the energy bill which makes a hole in your pocket? A Houston-based start-up ‘Mistbox’ founded in 2013 has developed a green product which could increase the efficiency of your AC by 30 per cent! Savings are due to two factors, decreased power consumption while the AC is running, and increased capacity in hot conditions which brings really long cycles back down into normal time ranges. A Kickstarter campaign is currently running for the Mistbox. You can reserve a full unit for pledges starting at $399. Alternatively, they also offer a subscription model where you can rent the device and have them handle all the maintenance for just $10 a month. 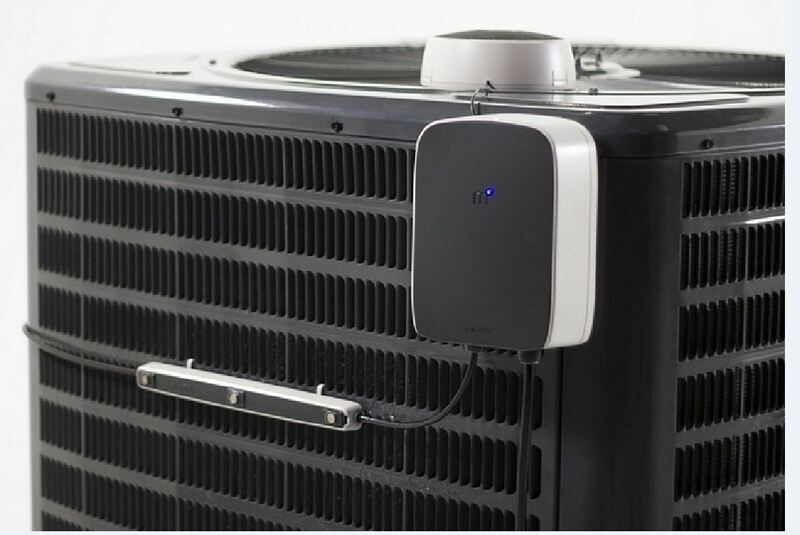 The Mistbox is mounted on the exterior panel of your AC unit; it pre-cools intake air and boosts the overall efficiency. The system consists of three divides- a mini-wind turbine, a mistbar, and a control unit. The wind turbine attaches wherever your AC’s condenser fan sits, as it uses the air from that to generate power for the system’s battery unit, while the mistbar clips on to the sides of your AC unit, where it sprays a mist of water to cool down the surrounding air. In-built sensors recognize every time the AC is running, prompting it to automatically turn on the misting system. 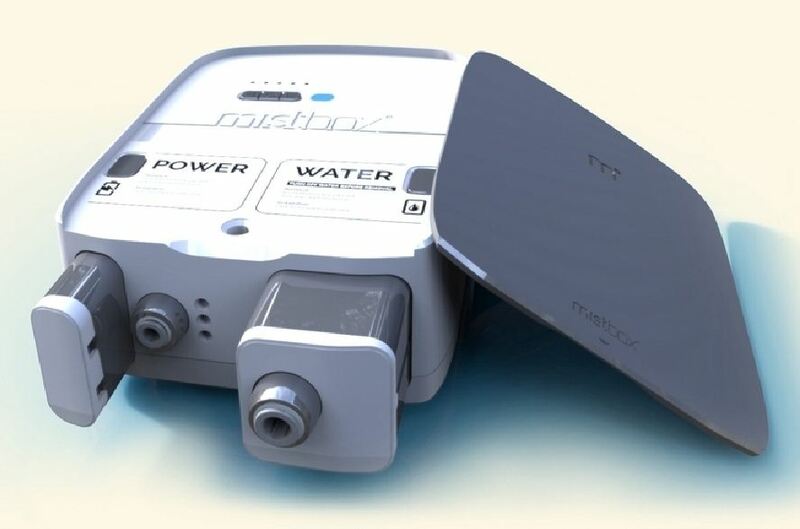 Mistbox uses a proprietary combination of advanced water treatment technologies to ensure mist cannot harm your AC unit. The water generated from the system flows to the mistbars, goes into the control unit where it passes through a water treatment filter to ensure the mist the system creates will not damage the AC unit. The water treatment system converts dissolved solids into microscopic nanocrystals. By killing all bacteria in the water and on the surfaces of your AC condenser, the chance of particles adhering is significantly reduced. It can be installed under 15 minutes initially; you only need a screwdriver to install the system! Steps are mounting wind turbine with a zip tie, plugging it into the control unit, mounting control unit with a screw or zip tie, clipping 4 spray bars on (tubing length can be adjusted via their patented manifold), and connecting to a hose. According to their Intertek study conducted to see savings in humid climates, the results were encouraging, 25%+ savings at 50%RH! It also contains the battery that powers the system and which the wind turbine supplies with its generated juice. Its companion mobile app logs every single time you use the AC, allowing your to have a detailed record of your AC usage over time. You need one Mistbox per AC unit. This is because Mistbox is designed to sense when the unit is running and optimize its misting schedule to that particular unit. As different units have different schedules, each needs its own Mistbox to efficiently maximize savings and avoid waste.